The Black Women’s Health Imperative (BWHI) announced a strategic partnership with the National Coalition of 100 Black Women, Inc. (NCBW) to address health disparities and provide more health education. 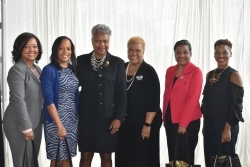 Atlanta, GA, April 17, 2019 --(PR.com)-- The Black Women’s Health Imperative (BWHI) yesterday announced a strategic partnership with the National Coalition of 100 Black Women, Inc. (NCBW) at the NCBW Day of Action and Advocacy in Washington, DC. The multi-year partnership was established to raise awareness of health disparities and solutions, and to provide access to vital healthcare and wellness information that promotes behavioral changes and healthier lifestyles in Black communities. The Black Women’s Health Imperative is a national non-profit organization dedicated to advancing health equity and social justice for Black women, across the lifespan, through policy, advocacy, education, research and leadership development. The organization identifies the most pressing health issues that affect the nation’s 22 million Black women and girls and invests in the best of the best strategies and organizations that accomplish its goals. The shared common priorities of BWHI and NCBW to reach the community and other key stakeholders about the health and wellness of Black women created an opportunity to partner nationally. The National Coalition of 100 Black Women (NCBW) was launched in 1981 with the mission to advocate on behalf of women of color through national and local actions and strategic alliances that promote the its agenda on leadership development and gender equality in the areas of health, education and economic empowerment. The national movement has garnered thousands of members who represent 60 chapters across 28 states. Several of NCBW’s national health and wellness initiatives, including addressing heart disease, diabetes, strokes and obesity among Black women, created an opportunity for BWHI to provide solutions through evidenced-based programming and research-driven policy recommendations. "I am very excited about NCBW's and BWHI partnership," states NCBW President Virginia W. Harris. "Together our goal will be to improve the African American health status and reduce health care costs. This partnership will leverage and maximize resources by pooling talent, expertise, and resources. It will also Improve outreach to stakeholders and enhance visibility, messaging and minimize duplication of efforts." Elements of the partnership will include hosting community health forums in cities across the country, collaborating on advocacy opportunities related to maternal mortality, diabetes, breast cancer and the Affordable Care Act, creating health tool kits for local NCBW chapters, and more. For more information about The Black Women’s Health Imperative, please visit www.bwhi.org.